She Who Must Be Obeyed found this recipe many years ago in the Reader’s Digest. It is an easy dessert we love. Cream thoroughly margarine, 250 ml (1 cup) of the sugar and vanilla in a large bowl. Add eggs one at a time, beating until light and fluffy. Add flour mixture and sour cream alternatively to creamed mixture, ending with flour. The batter will be fairly thick. Combine the blueberries with the remaining 50 ml (1/4 cup) sugar. Spread 1/2 the batter in a greased 25 cm (10 inch) springform pan. 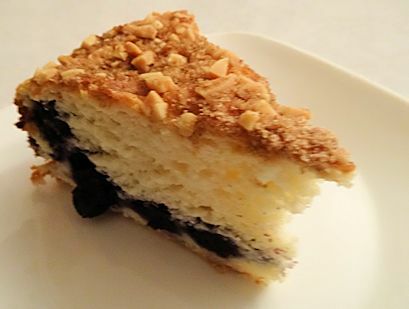 Sprinkle with blueberries and spread remaining batter over top. Combine the topping ingredients and spread over the batter. Bake at 180 C (350 F) For 50 to 55 minutes. Serve warm or cool. This is an adult dessert (the missus says that means I shouldn’t like it). It has a moist rich flavour without being incredibly sweet. The sour cream gives it a nice body and the blueberries give it a fresh flavour. We love it. Thanks so much for the very kind words, Sridevi! The dessert is easy to make and is not as sweet as most cakes. We love it. My sister-in-law made it and we loved this recipe. It’s so delicious. So nice of you to let me know. It is one of the best things She Who Must Be Obeyed makes!